"I have spent half of my life taking care of dogs. I want to spend the rest of it doing the same." As a young girl, Shreejana Thakuri used to tell her parents she would go to school only if she could bring street dogs home with her. 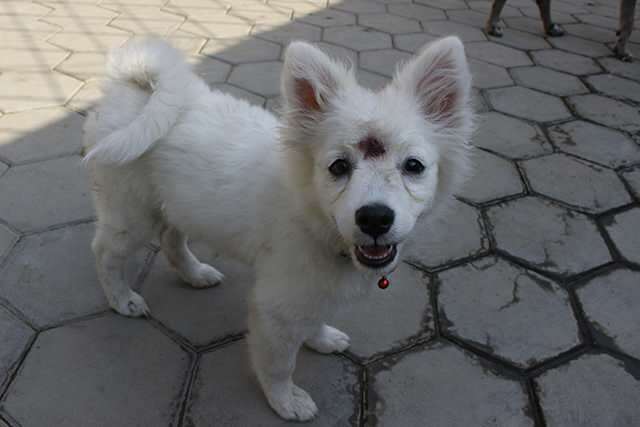 Her parents soon got used to their daughter doing just that: returning with strays she picked up on the streets. Thirty years later, Shreejana is still at it. Now 42 and the mother of a grown son, she still brings abused and abandoned dogs to her shelter in Baneswor, where there are 47 rescued animals at present. “I’m the kind of person who prefers dogs over people: I always had a soft corner for them,” says Thakuri, who estimates she has rescued more than 300 dogs. She even cares for animals that vets would put down because they're in such bad shape. Thakuri was married at age 15 and had her son a year later. After high school, she went to the US with her husband and was studying child development when she heard her father was diagnosed with terminal cancer. She left everything and came back to Nepal, but while caring for her father found out her son had autism. She introduces a visitor to Chanti, a dog that recently arrived at the shelter and is recovering from an acid attack. Most dogs there have been abused, are malnourished or suffering from diseases. From the affection the dogs give her, it is clear Thakuri has found her true calling. Among the animals are month-old puppies, and dogs pushing 15 years. Ten of them are partially paralysed and some are undergoing cancer treatment. Most are mongrels, but there are German Shepherds, Golden Labradors and Japanese Spitzs, abandoned by owners because of a disability or disease. 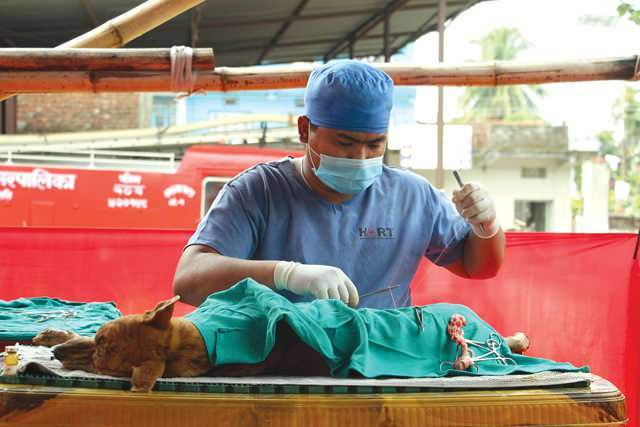 There are an estimated 30,000 street dogs in Kathmandu, and despite occasional spaying campaigns by organisations like Kathmandu Animal Treatment (KAT), the numbers are not decreasing. Thakuri had nearly finished building a spacious shed and playground for her dogs on a leased plot in Kusunti, but after spending all her budget the work has been stopped because of a complaint by a powerful Maoist leader who owns a nearby property. The leader is pressuring Thakuri to move out, claiming that her dogs will spread disease in a residential area. "Laws are rarely followed in this country, justice is an afterthought. But how humane is it to hassle a single woman with a handicapped son who is just trying to provide a better shelter for rescued dogs?" asks Thakuri, who says this is the fifth time she has been asked to move because of complaints from neighbours. Caring for four dozen, four-legged friends isn’t easy. It is also a costly business: medical treatment and food cost Rs200,000 per month. Thakuri sold her house in Hatiban to cover the bills and gets help from her husband , and donations. “I have spent half of my life taking care of dogs. I want to spend the rest of it doing the same. 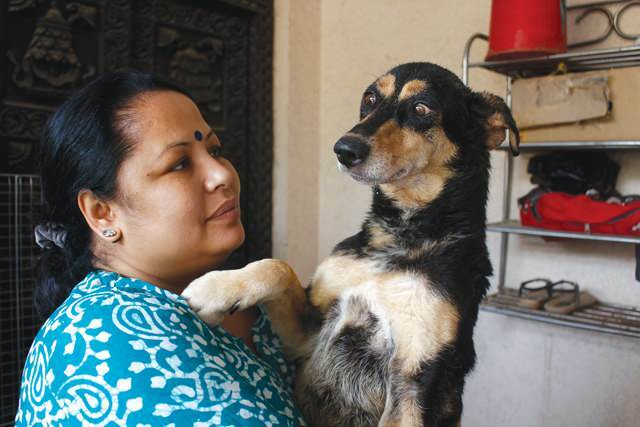 I wish people took better care of their pets,” says Thakuri, who offers her dogs up for adoption. Eight-month-old Chintu suffered broken bones after being hit by a car. It took three months of treatment for him to recover fully. He has been adopted and taken to the US with his best friend Tuk Tuk, whom Thakuri nursed back to health after he got pneumonia. Fighter is five months old, and was picked up on the streets with a dislocated leg. After surgery to insert a steel rod, he is now on the mend and waiting to go to a new home in Canada. Most street canine management programs in Nepal have been restricted to Kathmandu Valley. Now the Himalayan Animal Rescue Trust (HART) has started collaborating with municipalities to control the street dog population as well as combat rabies. So far, the mobile units have been at work in Pokhara, Bharatpur, Dharan, Birtamod and Khandbari in partnership with District Livestock Service Offices to vaccinate dogs against rabies and break the chain of rabies transmission from dogs to humans. This is done by vaccinating at least 70% of the dog population and controlling the dog population through neutering programs. There are no reliable statistics but it is estimated that 100 livestock die of rabies in Nepal every year. In addition, 1,000 livestock and 35,000 humans receive post-exposure injections every year, and the annual human fatality rate fluctuates between 50-100. The numbers of human who die from rabies could be much higher because of underreporting. The World Health Organisation (WHO) has set a global target of ‘zero human rabies by 2030’. 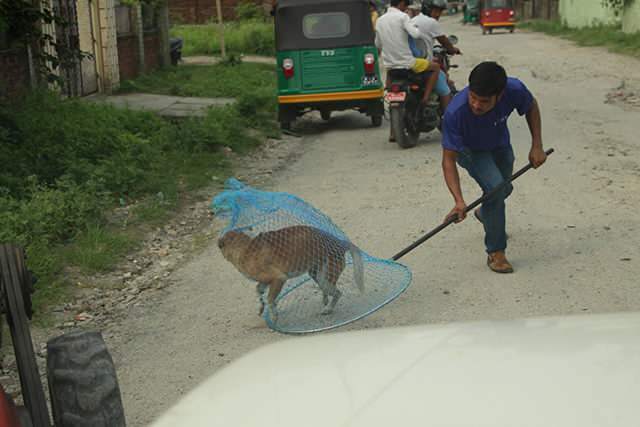 A dog being netted in Butwal. The HART program this year vaccinated 1,449 dogs in Pokhara, 1,248 in Bharatpur, 314 in Dharan, 128 in Birtamod and 236 dogs in Khandbari. In more than 800 dogs were sterilized in those cities. The vaccination campaign achieved 78% coverage of the total dog population in Bharatpur and 75% in Pokhara -- exceeding the recommended minimum of 70% for rabies control. 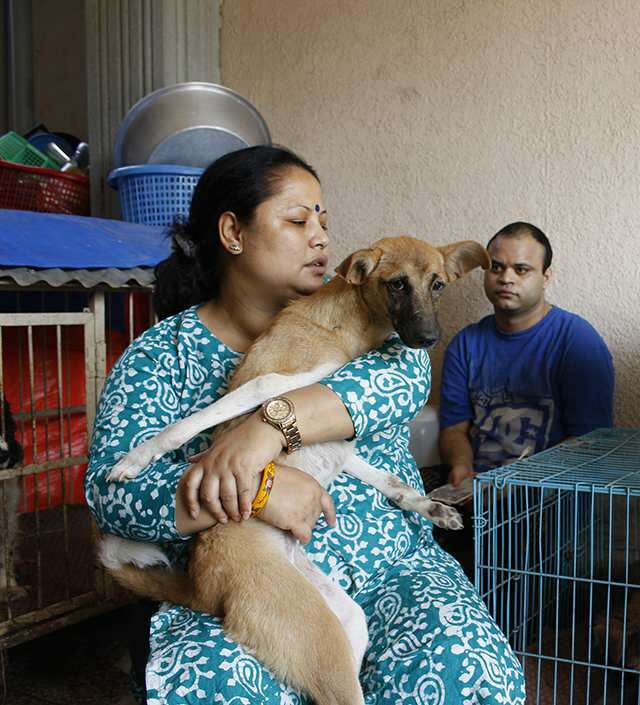 “HART and others are doing their best to address the dog population and rabies management through sterilization and campaigns to meet the WHO 2030 target,” says Khageshwaar Sharma of Trust. HART is funded by donations and works through its two bases in Pokhara and Chitwan throughout the country.